When the Oculus rep met my confused look with, “yeah, we weren’t sure it was going to work either,” I didn’t know what to expect. As it turns out third person works in VR. 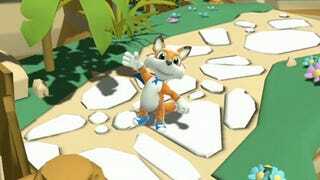 Developer Playful’s Lucky’s Tale is a shameless riff on Mario and other 3D platformers but its distinguishing feature is that third person camera in a VR headset - your view floats along behind the main character as if you’re following in a cart. The immediate impression is that of a theme park ride, something like Universal’s The Simpsons attraction, as you chase the main characters. It works. It shouldn’t but it does. Within seconds I forgot about the novelty aspect of the view and I was just playing a game. There’s no practical mechanic to the VR side of things (bar a look-to-aim bomb throwing bit) but being able to peer around the world or tilt your head to glance past scenery just left a huge smile on my face. Although to be honest almost anything on Rift makes me smile. The main thing is that it’s really opened my eyes to the potential of non-first person applications in virtual reality. Before playing Lucky’s Tale I’d never even considered VR being able to do anything that wasn’t an FPS, but now anything seems possible. One idea briefly mentioned that instantly clicked was an RTS where you could look around the map or battlefield as you play. I’m not entirely sure however how well it’s going to sit on the motion sickness spectrum though. It’s not a problem I suffer from but, even with my iron stomach, having no control or warning over movement does create a violent lurching sensation when your invisible cart starts to move along its tracks. I think that could be a problem for some. Aside from that, however, this is an interesting look at ways VR could be used in gaming that might not be immediately obvious. Like the dawn of 3D polygons or touchscreen gaming, it could take a while before they really work out what they can do with the tech and we start to see really innovative uses. A lot of ‘current’ Rift stuff is still, really, contemporary ideas put into virtual reality. This is too, obviously, but it proves that VR doesn’t start and end with a first-person view.